Get the most out of your next day at the beach with iPhone apps that help you plan when to go, and stave off sunburn and dehydration when you get there. 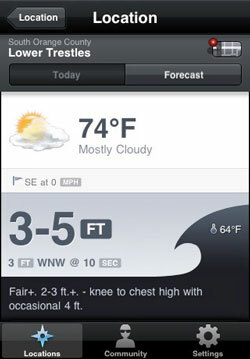 Check out the surf height, swell direction, tides and water temperature before packing your board. Check the UV index hour-by-hour forecast for the day and receive customized alerts for when you should wear sunscreen. Plug in your suntan lotion’s SPF and your skin type and the app pulls the UV index for your location to calculate how long you can stay in the sun. This simple app has timers that remind you to turn over, reapply suntan lotion or check on your loved one’s tanning status. It’s easy to get dehydrated at the beach, so use this app to keep your water intake on track.